The 840 headset add Bluetooth and not much else. The SteelSeries Siberia 800—once known as the “H Wireless”—has long battled it out with the Astro A50 as our favorite stupidly expensive gaming headset. The A50 had slightly more spacious audio and a more comfortable form factor, while the Siberia 800 had a more attractive base station, swappable batteries for worry-free charging, and a more professional-looking design. And for 2016? Not much has changed. Outwardly, the biggest change to the Siberia 840 is that the facing side of each ear is now silver instead of black. Yeah, this is one of those “barely changed anything” refreshes. Other than the fancy new earcup livery, the 840 is a clone of its predecessor. 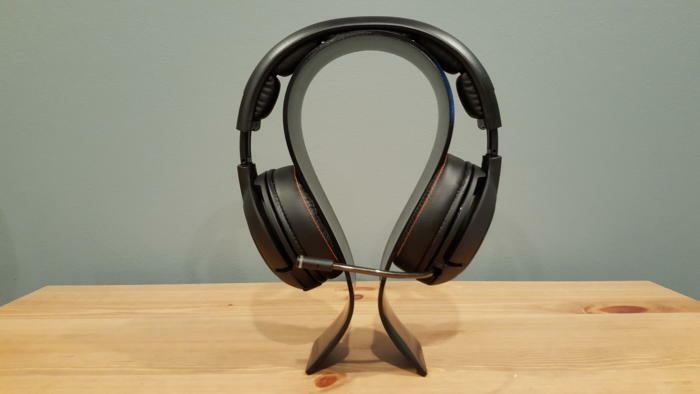 It’s a wholly unpretentious black arch, generic to the extreme but for the understated SteelSeries logo etched into each side and the orange stitching highlights. Circular earcups decked out in leatherette complete the design. Retract the microphone back into the headset and you’ve got something that could easily have come from Audio-Technica or Sony or Sennheiser or any other general-purpose headphones manufacturer. I like it. As far as gaming headsets go, this is one of the least flashy designs on the market. Which I guess plays into the 840’s biggest addition: Bluetooth support. With such an understated design, SteelSeries apparently decided people might want to use the 840 with their phone, maybe while out and about on the street. Will they? I don’t know. The 840s are a bit bulkier than competing over-ear headphones (like say Audio-Technica’s ATH-M70X) and feel somewhat flimsier. But the option is available. The 840s are primarily built for gaming in the home though, so we’re going to focus on that use-case. And for that, the 840s (like the 800s and the H Wireless before) possess some unique features that I absolutely love. 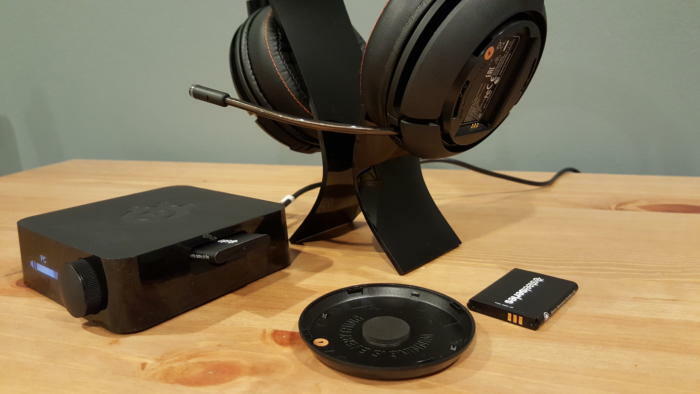 It comes down to SteelSeries designing a base station that’s actually useful. 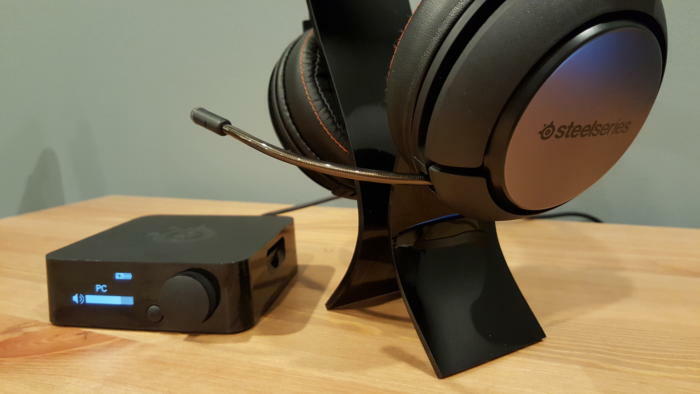 Astro’s new A50s at least use the base station as more than a glorified Dolby toggle, building in a charging/display stand and a battery indicator. But SteelSeries has Astro handily beaten in the base station department. Rather than forcing you to download yet another piece of software on your PC, you can tweak practically any aspect of the 840s through hardware. EQ, Dolby, source selection, chat mixer, sidetone, and volume are all readily accessible, displayed on a small OLED screen. You can also tweak most of these settings from the headset, even if you’re sitting across the room. The “volume wheel” built into the rear of the right earcup can actually be pushed in, giving you one-button controls to change EQ or other settings on-the-fly. Last, but certainly not least, is the 840’s unique battery solution. While most gaming headsets use built-in lithium-ion batteries recharged by MicroUSB, the 840 headset uses swappable batteries instead. The headset comes with two lithium-ion batteries, each rated at 20 hours. One goes in the headset, while the other plugs into the base station to charge. Out of battery? Swap ‘em. This is admittedly less an advantage than it used to be, now that most headsets (Astro’s A50 included) come with batteries rated at 12 to 15 hours. The likelihood that your wireless headset runs out of battery mid-session is lower than ever. But—but—it’s still possible you’ll end up playing with a USB cable threaded to your so-called “wireless” headset, if you forget to plug it in overnight. The 840s? Yeah, you’ll never have that problem. Not that the 840s are perfect. The headband is tight, especially the first few wears, and the earcups could use more padding. Even after months of use, they’re never quite as comfortable as the A50s are straight out of the box. I’m also not a huge fan of circular earcups, with my ears prone to rubbing against the tops and/or sides. The earcups are part and parcel with the 840’s audio woes, too. I wouldn’t go so far as to say the 840s sound bad—they produce a relatively clean and balanced sound, far from the EQ-boosted audio of the A50s. But the audio sounds so small. 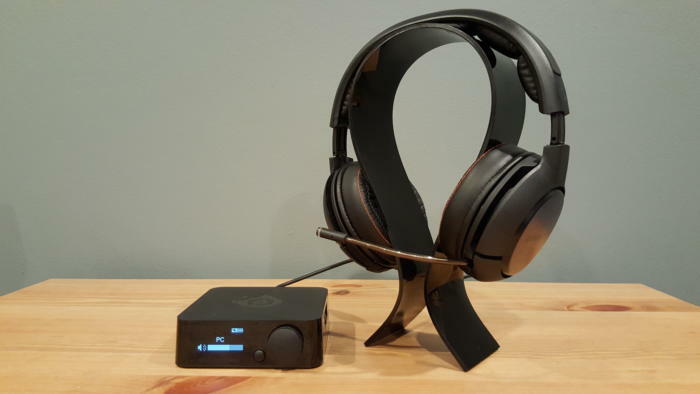 Even at higher volumes the 840s lack the large soundstage and presence of other, more spacious headsets like the A50, Logitech’s G933, or even the $80 HyperX Cloud. This isn’t much of an issue with the direct-to-your-ear immediacy of music, but it sometimes renders games and films a bit less impressive on the 840s. It also makes the inclusion of faux-7.1 audio a bit moot. I’m not a fan of these emulated 7.1 systems at the best of times (aka the G933) but the 840s are middle-of-the-pack at best when it comes to Dolby-fying your stereo headphone audio. Avoid. As I said, they’re not bad though. The 840s can be a bit bass-heavy, same as any gaming-oriented headset, but it’s nowhere near as bad as most competitors. Mids are very precise, highs can be a bit distorted but generally sound fine at normal volumes. In so many words, the 840s are above-average for a gaming headset—but like I said with the A50s, maybe not good enough to deserve their $300 list price. 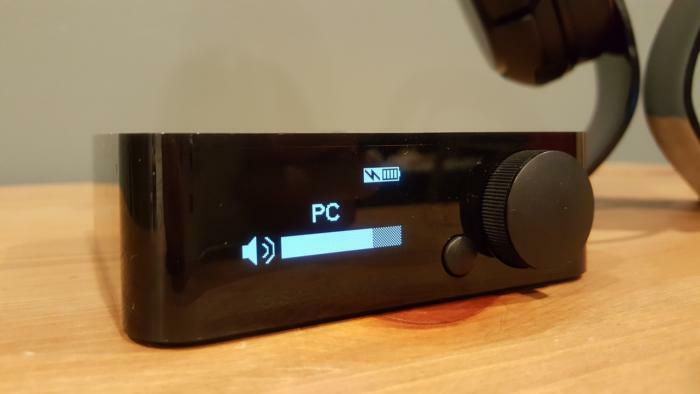 With Logitech and Corsair providing more competition from the low-end, and excellent hi-fi headphones coming in around the same price, it’s just harder to justify nowadays, with or without a replaceable battery. It doesn’t help that the other half of the 840 headset equation—namely, the microphone—is one of the weakest I’ve tested, especially in this price tier. This is a running theme with SteelSeries, it seems. My voice sounds nasally, and I feel like I have to talk quite a bit louder than in other mics. Worse, the mic sometimes picks up and echoes game audio or whatever else you’re listening to (particularly if you’re listening at high volumes), which can annoy the hell out of your teammates when you’re playing. When part of the cost here is that it’s a headset and not mere headphones, a so-so microphone significantly diminishes the value of the whole package. Still, I think the 840s make a decent contender. Astro and SteelSeries are basically the only ones playing in the $300 end of the sandbox at this point, and I think there are points in favor of both the A50s and the 840s. What SteelSeries needs now is a more substantial refresh, though. Astro leaped ahead in key areas with this year’s A50 overhaul, and the inclusion of Bluetooth in the 840s is too niche to matter to most people. The next version needs better audio and a more comfortable design if it’s going to stay competitive, moving forward—let alone justify that $300-plus price tag. Not much has changed with the Siberia 840s—mainly the inclusion of Bluetooth—but it's still a solid headset thanks to an excellent charging system.